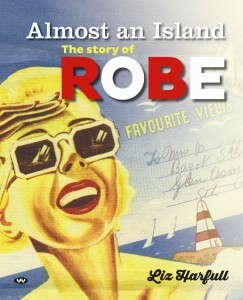 Almost an Island: the Story of Robe is a special book which brings together the stories, memories and images of a small place, tucked away on the rugged Limestone Coast of South Australia, which has played a remarkable role in history. In what turned out to be a brief, golden heyday as one of southern Australia’s busiest ports, during the 1850s it witnessed fine clipper ships bound for London with loads of wool, the arrival of thousands of Chinese on their way to the Victorian goldfields, and the hijinks of partying pastoralists. Fifty years later Robe cast off the doldrums to reinvent itself as a seaside health resort, lauded for its natural beauty, and the beneficial qualities of its cooling sea breezes and salt waters. And fifty years after that, the first surfers arrived, establishing what is now recognised as one of the world’s oldest continuous surfing competitions. Author Liz Harfull has worked with the residents, holiday home owners and visitors over several years to research and write the book, and gather up hundreds of images and historic ephemera to illustrate it. Here you will find pioneering settlers and aviators, fishermen braving wild seas in small wooden boats, famous painters and poets, chefs and winemakers, and meet some of the thousands of families drawn to this fascinating virtual island to escape their hectic everyday lives. The Robe book would not have been possible without the very generous support of following supporters who have provided cash donations towards the cost of production.